Since having our beautiful baby girl three and a half months ago, our movie theater nights have become non-existent. We thoroughly enjoyed sitting at the theater, watching a blockbuster hit, and eating hot, buttery, fresh popcorn that made us lick our fingers for more. The more I think about it, though, we were attending crowded movies while sitting in an uncomfortable theater surrounded by people we didn’t know, eating over-priced popcorn and drinking over-priced soda. A night at the movies for two was about $40 and forget about the cost of a babysitter. Enter the Waring Pro WPM40 Popcorn Maker and bring the movies home, literally. Last night, I returned to North Carolina to our new Waring Pro Professional Popcorn Maker. Athena’s bed time came at 8pm and Big Brother was followed by Falling Skies. Instead of spending $40 at the theater, we spent the evening on our comfortable couch, watching two of our favorite summer shows, and eating fresh, hot, delicious popcorn buttered to our liking. In less than two minutes, we made a bucket of popcorn for the price of a few kernels at the theater. The heat lamp kept the popped corn warm and the door and pivoting kettle were easy to remove for cleaning. Instead of taking up our cupboard space, we picked up the trolley and placed it in our living room adding the perfect nostalgic accent. Even if we didn’t like popcorn, which is the silliest statement I ever heard, we’d still love the look of the Waring Pro Professional Popcorn Maker. With popcorn that tastes better than the what we get at the theater, our own comfy couch, and time to ourselves, we’re finding ways to combine our old life with our new one and we couldn’t be happier. This entry was posted in Family and tagged bucket list, Bucket List Publications, Children, Family, life, photo, photography, popcorn, popcorn maker, USA, vacation, Waring, Waring Pro by lesleycarter. Bookmark the permalink. It’s a shame movie going is so pricey these days. I used to enjoy going once in awhile now you have to think twice if you can afford it. Usually I stay away from the over-priced popcorn when I do go. It’s not good for my health anyway lol. At least home is good enough experience these days, unless you don’t have A/C like me. I love fresh, hot, buttery popcorn!! I agree! Movies at home are much better than going out. I haven’t tried home made popcorn but I’m tempted now! I love that machine,I don’t have one, but an old boss used to bring it to work. Fun!!! We have the cutest little theatre in our small town that makes the BEST popcorn in the world. It’s $3 per person to get in. $10 for a large popcorn you can refill as much as you want (even if you are walking out the door after the movie)…and a large soda..same deal. They even give you little bags for every member of your party. For $25 bucks, my party of five can see movies (we saw Batman last night) and thoroughly stuff ourselves until we feel sick. And it’s less than a mile from our house. Very cute, and retro. BUT. We are crazy lucky. I love your idea of the home popper! When our babies were small, rented movies were just the ticket. Hahaha I have a mini version of that! It’s only about 40cm tall, but it’s the exact same design! Home popped pop corn rules and it *does* look excellent in your house. What a great idea! And being able to add real butter will be a treat for sure! Nothing like your own comfy couch to watch your favorite movies while eating popcorn flavored the way you want it! Enjoy! Yes, and the multiplexes deliberately make the popcorn more salty so you feel the need to soothe your parched tongue with a soda too…Great idea! Mmmmm I use a Whirley Pop! Not quite as fancy, but it makes a great Christmas gift and delivers the most delicious movie-esque popcorn! I stopped buying it at the theater because what’s the point? – I can cook it at home for next to nothing and season it to my liking! I love popcorn, but alas it is too indulgent for my plan to slim down. Because movie going is to pricey, we know reserve going to the movies for special movies that would warrant us paying the extra bucks to do reserve sitting and be able to order a full meal. Places like AMC’s Dine In theatres are starting to pop up across the nation. 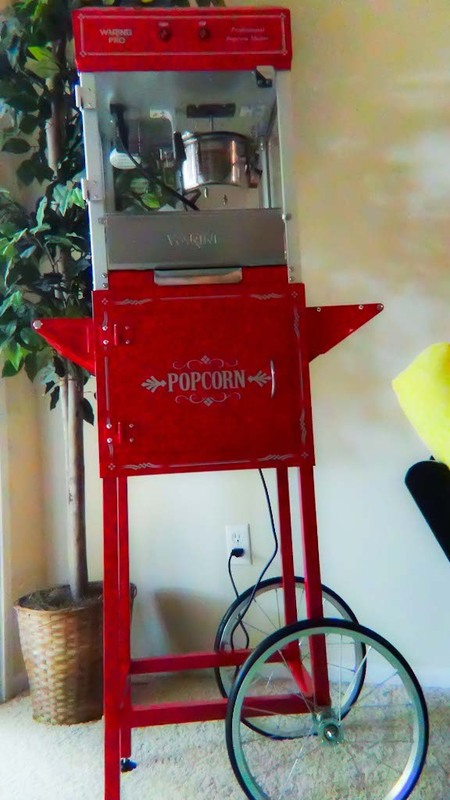 However, IF popcorn was something I could consume on a regular basis I would totally buy a machine like yours. Yum…now I’m hungry for that salty, buttery goodness! Thanks for the tip! That is awesome! We make a lot of popcorn, but only on the small air popper. This inspires me to do some shopping. I love popcorn. It is a must have for the movies. 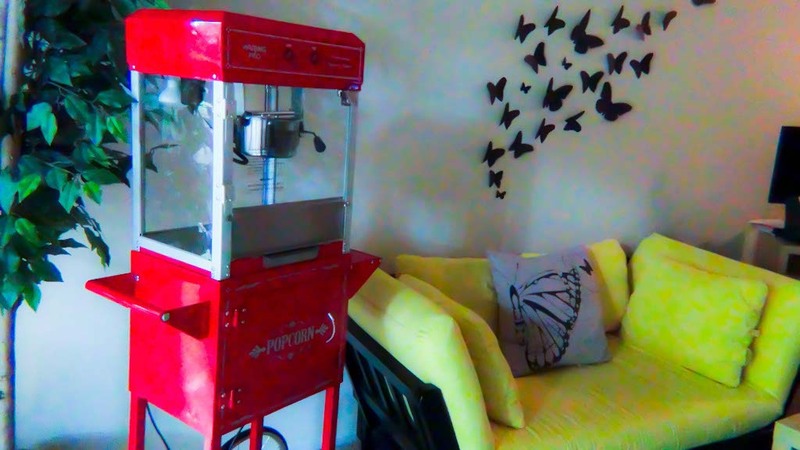 Yeah, there’s something magical about the big red popcorn popper. Brilliant! I LOVE popcorn and I love this idea. You know you’re gonna be hosting movie nights, right? I totally love that! Like the rest I love popcorn when I go to a movie. That is always my meal of choice. I’m a cheap date even if the popcorn is expensive because I don’t need anything else! Thanks for sharing! It so looks like the popcorn makers in the movie theaters. But I am guessing since you are making it at home, it tastes so much better. Have fun with it! I LOVE popcorn…I have a simple air popper that I’ve had for several years…pour in 1/2 cup organic kernels (cost 10 cents),pop for 1 minute and add a little olive oil and, if I’m feeling dangerous :), a pinch of sea salt and sugar. Then my husband and I sit back and watch old classic movies, BBC specials or whatever we please. No noisy people behind us, no bother if we need to go to the bathroom…just put the movie on pause. 🙂 And no crazy movie ticket prices. Definitely the way to go. And, with what just happened in Aurora (I’m in Colorado Springs, just down the road from there), home is simply a safer place to be. We really enjoy the experience of making some popcorn, sit on the couch and watch a movie. 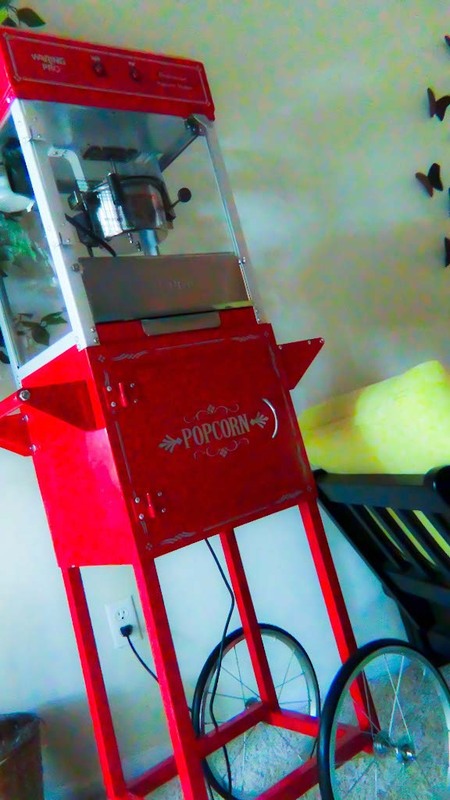 There is a few movies a year that we go to the theater to see but much prefer making our popcorn at home made the way we like it and kicking back and watching a movie. Love your popper that you bought. If I had this machine I would make popcorn every night. It would be dangerous for me to own….but is probably still going on my wish list.. 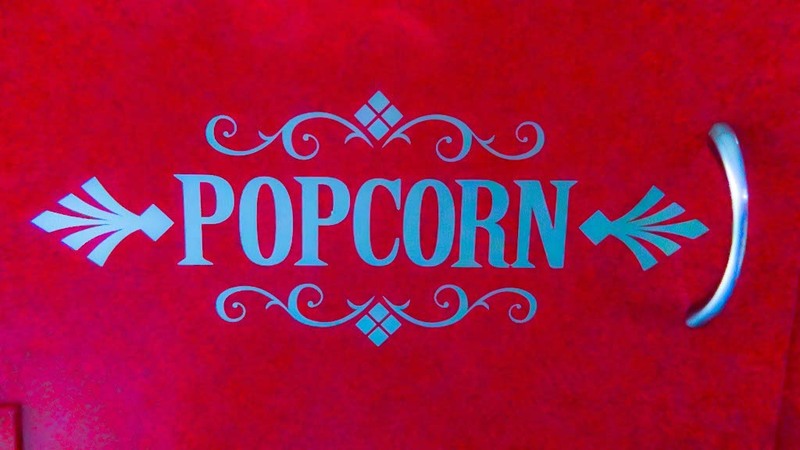 Hoping that your vacation time has been good for you.I LOVE popcorn! Now I am really getting hungry..You have a point about watching films at home vs going out. Home is best for me, too. BTW- you have been nominated for a blog award at my blog. Enjoy and have a good Monday. Oh watching movies at home gives me the option of the Pause button, which I sometimes thoroughly miss in movie theaters! It is only when you have children that these investments suddenly make sense… My husband and I also have popcorn making movie night at our house… Our children are a bit older now so sometimes we let them stay up late for movie night and sometimes we just have movie night on our own. We love it. Heck, yeah! That popcorn maker looks awesome. My friend Joan would be in heaven if she could make that much popcorn at a time. 🙂 Thanks for stopping by my blog and reading my post on high country running, too. Thanks for this idea. I love popcorn, particularly the smell, close to the honey-roasted peanuts I remember from the Munich October Fest. I didn’t know about popcorn machine. Checked and saw a mini one at amazon UK. Makes a wonderful present, too. This is so cool! My husband will love to have this while watching his Space movies. Thanks for sharing. That thing is awesome! Post kiddos, we find home movie nights to be such a relaxing way to spend time together, treats are a must! I have never liked the theatre, even as a kid. I do like the movie popcorn, so I may have to look into this for a Christmas gift to my family and myself! Sounds fun and delicious!! Someone recently recommended using black truffle oil, instead of butter. Can’t wait to try it. Have a great day! Whenever we go to the theater my son walks out with a whopping headache. He says it is too loud and the intense lights hurt his eyes. He has some light sensitivity issues. We rent movies from the library (it’s free) and make popcorn at home. Sometimes we buy the movies which we can watch again and again. It’s not everyone’s cup of tea but we love our movie nights at home. the hubby gave me a spongebob version & i totally love it! Best thing ever, we did the same and now that our kids are older it gets more use, this is one of those items well worth the spend! Enjoy! That’s awesome! Another plus about staying in is you don’t need a baby sitter!